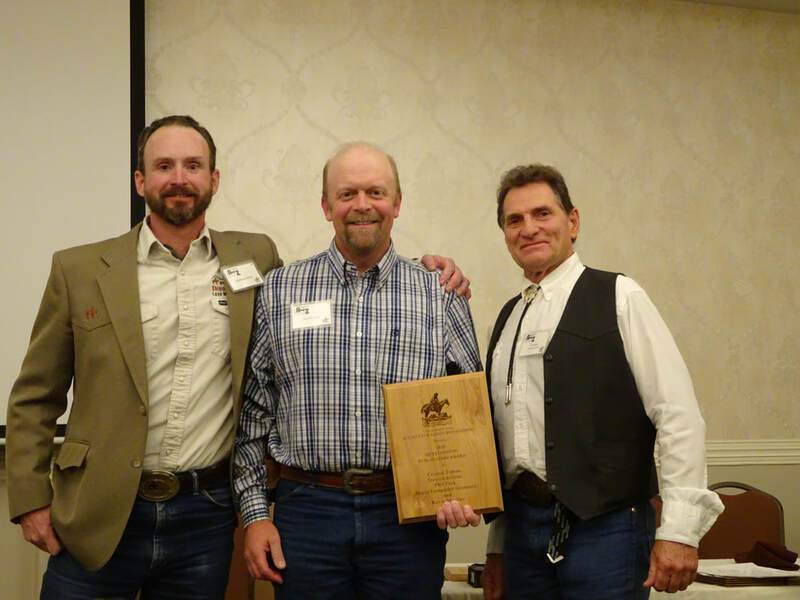 Each year at our fall meeting we are proud to acknowledge outstanding section members for their achievements and commitment to rangelands. Awarded to Past-President Julie Elliott (right) by outgoing President Dan Nosal (left). This award is the highest given to a section member for outstanding accomplishments to the range management profession and for exceptional service to the section. The nominee must be a member of the Colorado Section and SRM for the past five years. Awarded to Hailey Wilmer (center) by outgoing President Dan Nosal (left) and Matt Barnes (right). 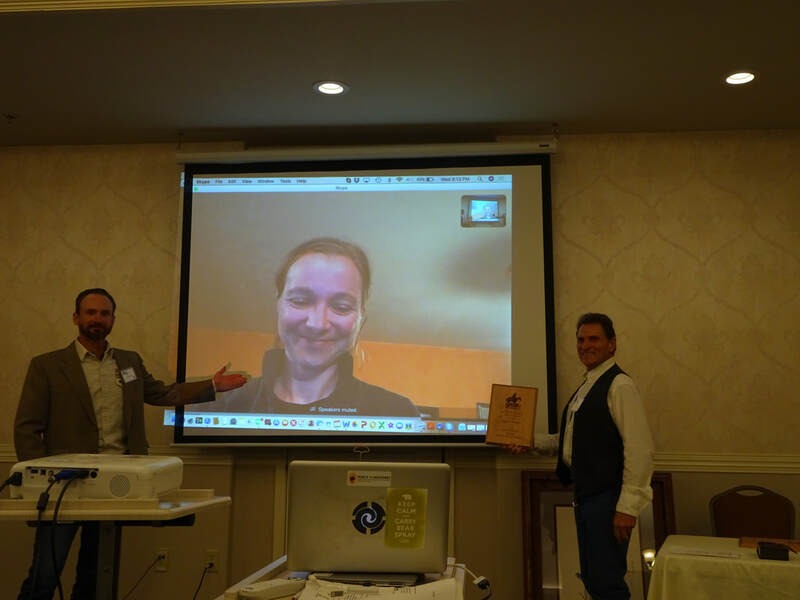 Award was presented to Crystal Tipton, Troy Ocheltree, Kevin Mueller, Phil Turk, and Maria Fernandez-Gimenez of Colorado State University for the article "Revision of a state‐and‐transition model to include descriptions of state functional attributes" published in Ecosphere in May 2018. Pictured: Paul Meiman (center) accepting the award on behalf of Colorado State University from nominator Matt Barnes (left) and President Dan Nosal. This award is to recognize: noteworthy scholarly, literary, and aesthetic contributions, and efforts in publicizing range management practices, philosophies, and research activities. Awarded to Dixie Crow (right) by outgoing President Dan Nosal (left). Awarded to Past-President Josh Saunders (right) by Outgoing President Dan Nosal (left). Awarded to Dan Nosal (right) for a successful year by incoming President Clare Hydock (left). Awarded to Cody (right) by Paul Meiman University Student Affairs Committee Chair (left). Awarded to Lee (right) by Paul Meiman University Student Affairs Committee Chair (left). Awarded to Sarah LeVane (right) by Paul Meiman University Student Affairs Committee Chair (left). 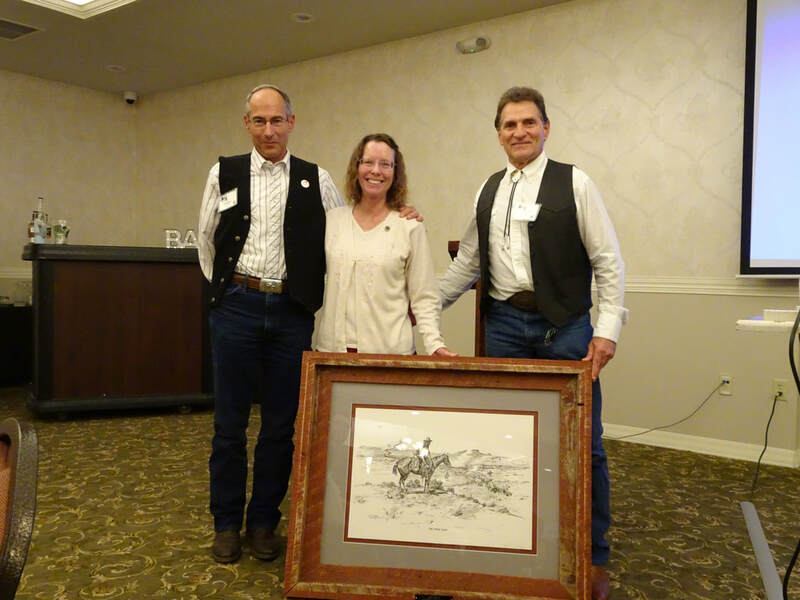 Awarded to Leininger Ranch for Hosting Fall Tour by Andrea Leininger (right) by outgoing President Dan Nosal (left). Awarded to Mysti Tatro accepted by Sarah LeVane(right) by outgoing President Dan Nosal (left). Awarded to Josh Tashiro (right) by outgoing President Dan Nosal (left). Awarded to Chase Dryden (right) by outgoing President Dan Nosal (left). Award nominations are due by June 30th of each year. Award winners are announced at the fall annual meeting. Award criteria can be found in the pdf below and nominations can be sent to our Awards Chair by clicking the button below.